Need a post driver for your Drive-Tight Post or Angle Post? Our galvanised post drivers are designed specifically to drive these posts in with minimal hassle. 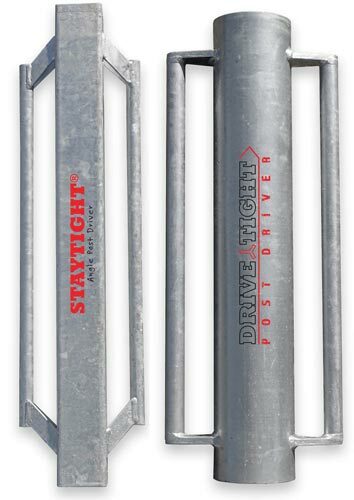 Our round post driver is designed specific for our Drive Tight posts. It is made from 120NB pipe so it can easily fit over 100NB strainers. Weighing at 17kg, it has enough weight to help you drive the post in, but still light enough to lift. Made from quality steel, and hot dipped galvanised, you can trust that it will last. Our angle post driver is made for our 75mm angle posts. It is made from 90mm steel RHS and has been hot dipped galvanised to ensure a rust resistant driver. Are you worried about lifting 17kg on top of your Drive Tight strainer post? A simple solution is to lie your strainer post on the ground with the picket end towards the hole. Slide the post driver over the round end of the post. Grab the handles of the post driver and pull up the post. It will fall into the hole and you can start driving straight away.